March Birthstones: Aquamarine and Bloodstone | The Green Man Store L.A.
Aquamarine: the very name makes you think of the ocean, and the range of blue-green hues found in the gemstone mirrors this. In fact, sailors used them to bring themselves good luck and safe voyages. Aquamarine is a beryl, as are emerald, morganite, and other gems. The blue color is calming and helps with communication (blue being the throat chakra color in most systems). It was said to guarantee unity and long marriages, so it’s a lovely gift for weddings; in fact, it’s one of the gifts for the 19th anniversary. Like seawater, it is cooling, sometimes literally–I wonder if it’d be good for hot flashes? 😉 In the Middle Ages it was considered an antidote to poisoning. Nowadays we could possibly look at that as helping you get away from negative thoughts that “poison” you. Aquamarine was said to reconcile enemies and even re-awaken love between two people. Physically, it was said to counter all infections, and especially eye ailments. Aquamarine is good for meditation, calming, and mental health. Some say aquamarine connects to the Goddess; and really, what Goddess wouldn’t enjoy such a beautiful gem? 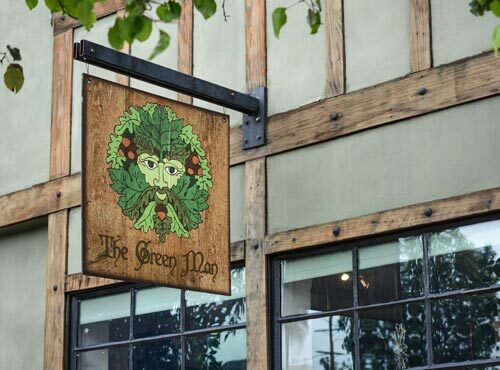 At The Green Man, the “shorthand” for bloodstone is “Be here now.” Bloodstone, generally a dark green with spots of red, is centering, healing, and grounding. It is also called Heliotrope, from the Greek for “to turn the sun.” (Interesting: a heliotrope flower is purple, not green and red, and doesn’t resemble the stone at all, but is said to turn its flowers toward the sun.) 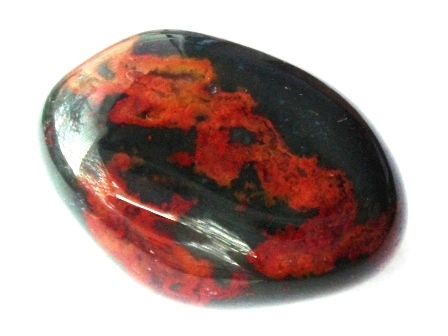 It is sometimes called Blood Jasper, but it’s actually a different crystalline composition than jasper. It’s sometimes called “The Martyr’s Stone” from a legend of drops of blood from Jesus on the cross staining stones at the foot of the cross. 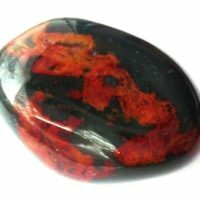 As far back as 5000 BCE, there are references to bloodstone’s healing ability. Babylonians used it especially for blood disorders, for protection, and for divination/prophecy. The Egyptians felt it increased strength, made them invisible, and helped defeat enemies. Others believed it could help with weather magic and legal justice. I have to wonder when bloodstone became a birthstone for March; I certainly don’t remember it from when I was young–back in the Dark Ages ;-)–and it certainly seems to be a bit more…shall we say…intense? than many other birthstones. But hey, it gives a choice (perhaps men prefer it to the more feminine aquamarine? ), and gives us a chance to learn more about a very useful stone.